Nine of the 11 ahupua`a comprising the Ko‘olau-poko District border Kāne‘ohe Bay, which, at nearly 11,000 acres (45 km2), is the largest sheltered body of water in the Hawaiian Islands. The area of Kāne‘ohe Bay is defined by a straight line drawn from Kû'au (Pyramid Rock) light on Môkapu Peninsula at the southeast end, across the barrier reef, through the center of Mokoli'i Island, to the shoreline at Kualoa ridge to the northwest. The bay itself is approximately 8 mi (12.8 km) long and 2.7 mi (4.3 km) broad, with a mouth opening of about 4.6 mi (7.4 km) and maximum depth of 40 ft (12 m). Kāne‘ohe Bay was formed by rivers eroding the basaltic Ko‘olau volcano at a time in O'ahu's geologic past when sea level was lower than it is today. As sea level rose, reefs, reef-derived sediments, and land-derived materials filled the bay to its present general configuration. In more recent years, the bay has been modified by dredging and other human activities. Today, Kāne‘ohe Bay is essentially composed of a barrier reef across the mouth, with two navigable channels cutting the northern and southern ends of the reef, a lagoon containing patch and fringing reefs behind the barrier reef, and a southern part of the lagoon that is partly enclosed by Mokapu Peninsula . The barrier reef extends most of the length of the bay. A sand bar (Ahu o Laka) and Kapapa Island are part of this barrier reef system. Within Kāne‘ohe Bay are found five major islands and islets: Ahu o Laka, Kapapa, Mokoli'i (Chinaman's Hat; see Kualoa), Kekepa (Turtleback Rock), and Moku o Lo'e (Coconut Island). The largest of these is Coconut Island, an isolated remnant of the Ko'olau's volcanic activity located in the southwest part of the bay, State-owned, and home to the University of Hawaii, Hawaii Institute of Marine Biology (HIMB) and Pauley-Pagen Laboratory (SOEST). In addition to these five, several others occur off the coast outside Kane`ohe Bay. Mânana and Moku Manu, located off Mokapu Peninsula, represent old tuff cones or other secondary eruptions. Two navigable, shallow channels cross the barrier reef into Kāne‘ohe Bay: Mokoli'i Passage and Sampan Channel (Kāne‘ohe Passage). Mokoli'i Passage, the deeper approach from the northwest, was dredged during 1939 to 1945 by the U.S. Navy to a depth of about 25 ft (7.6 m). Sampan Channel (Kāne‘ohe Passage), to the southeast, is entered about 0.8 mi (1.4 km) northwest of the northern extremity of Môkapu Peninsula. This channel intersects a deeper channel about 0.9 mi (1.5 km) west of Môkapu. Since it has not been dredged, Sampan Channel is used only by smaller boats. Its depth is about 8 ft (2.4 m). A dredged ship channel extends the length of the bay, connecting MCBH with Mokoli'i Channel and providing deep-draft ship access between the bay and open ocean. Kâne'ohe Bay is a Naval Defensive Sea Area established by Executive Order No. 8681 on February 14, 1941. Naval control over entry into this area has been suspended except for a 500-yd (500-m) prohibited area, or buffer zone, around the perimeter of Môkapu Peninsula, through which only authorized vessels may enter. Crashboat Channel, about 0.4 mi (0.6 km) west of the peninsula, has been dredged by the Navy for search and rescue vessels. This channel is within the prohibited area. The annual range of surface water temperature in Kāne‘ohe Bay is approximately 19.5 to 27.8 oC. Mean surface water temperature in January is about 21.6 oC. In August, surface waters average 27.4 oC. Water quality within Kāne‘ohe Bay has been studied extensivly over the years. Ongoing research on water and sediment quality (including access to data) is explained at the UH-SOEST CISNet Kaneohe Bay web site. The coastline along Kāne‘ohe Bay has narrow sand and coral rubble beaches, in places obscured by hau trees (Hibiscus tiliacea) and/or mangroves (Rhizophora sp. ), and many old, walled fishponds. Some of these, such as He'eia Fishpond and Waikalua-Loko, are still in use. Yet others were filled to develop as housing tracts. Shoreward of the bay's mudflats and bordering most fishponds are scattered wetland, marsh, and mangrove areas. Fringing reefs occur seaward of the shoreline, except for gaps where freshwater streams -- such as Waiâhole and Waikâne -- enter the bay and form deltas, or where dredging has occurred. Kāne‘ohe Bay is among the most important marine areas in Hawai'i, supporting diverse commercial, subsistence, and recreational uses. Fishing is one of the primary activities and encompasses all three types of uses. Baitfish (mostly nehu or Hawaiian anchovy, Encrasicholina purpurea) for the state's skipjack tuna (aku, Katsuwonus pelamis) fleet are caught largely in Kâne`ohe Bay. Many other species of fish, invertebrates, and marine algae (limu) are landed here each year. Recreational activities such as boating, jet skiing, diving, snorkeling, kayaking, and water skiing are also popular in the lagoon. Due to the proximity of HIMB, the bay is also used extensively for research purposes by scientists from Hawai`i and elsewhere. Consequently, its coral reefs are among the most intensively studied natural systems in the world. The security buffer around Môkapu Peninsula, which prevents commercial and public recreational fishing access, represents a de facto marine refuge. This coastal nearshore marine environment within the buffer zone, along with Nu`upia Ponds, undoubtedly contributes substantially to the sustainability of the area's marine resources. 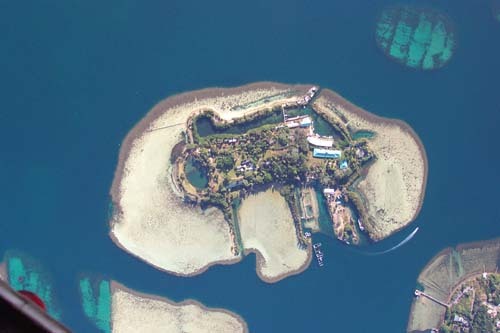 The reef around Coconut Island is also a protected reserve.